Oh, the Horror! 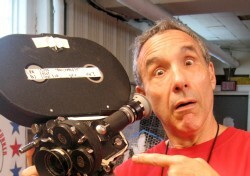 recently conducted an exclusive interview with independent film legend and president of Troma Entertainment, Lloyd Kaufman. As always, he's knee deep in a bevy of projects, including the upcoming Tromadance Film Festival, Father's Day, and, yes, Toxic Avenger V. We also get his thoughts on everything from Net Neutrality to the recent remakes of Troma properties. Oh, The Horror! : So how are you doing tonight? Lloyd Kaufman:Very good, what's going on Brett? OTH: Oh, not much, just kind of continuing our Oh, the Horror tradition. I think the last time when you talked to the other Brett, he had some alcoholic assistance, and we thought we shouldn’t tempt fate. So we’ve kind of invented our own Lloyd Kaufman drinking game. OTH:So what are you working on currently? As I always, I imagine there’s a lot on your plate. LK: Yeah, well we’re getting ready for the Tromadance film festival which is coming up on April 22nd and the 23rd in Asbury Park, NJ. And we’re working on editing Father’s Day and finishing up Mr. Bricks: The Heavy Metal Murder musical, and working on the script for Toxie V, so we have a lot of irons in the fire. LK: Yeah, we’re trying to get a decent script, which is not so easy. We’re on the third writer now, and hopefully we’ll get a good draft in a month or so, we’ll see. OTH: Speaking of Tromadance, I’ve actually seen one of the movies that will be playing there, The Taint, and it’s nuts. It’s going to fit right in. LK: I believe that is a world premiere, and I hear it’s excellent. I haven’t seen any of the films that will be playing because I’m not on the selection committee. So I’ll be going in to watch the films just like everyone else. OTH: One thing that I find interesting is that you actually majored in Chinese Studies in college, which a lot of people wouldn’t expect. LK: That’s right, I did; I think it’s important to have an education no matter what you’re going to do. So I learned about China and Africa because I didn’t get to in high school. OTH:You kind of give hope to those of us with weird, liberal arts degrees that don't translate well into the real world. LK: Well, life isn't all about money. If you want to be an artist, be an artist. OTH: Another thing I’ve noticed you’re passionate about on Twitter is Net Neutrality, so I’ll give you a chance to talk about why that’s such a big deal. I don’t think a lot of people are aware of what it means. LK: Yes, it’s a very important issue because we need to make sure the playing field is level for everyone on the internet. We need to make sure media conglomerates aren’t able to take over the free and open internet we have today; it’s keeping with the spirit of independent film-making and giving everyone a chance. OTH:Along those same lines, are you still working on Sell Your Own Damn Movie? LK: It’s actually finished! I’m not sure when it’ll be released, sometime in June or July. There’s a link for it on Amazon: Sell Your Own Damn Movie. OTH: That brings me to the question of distribution: do you think it’s become easier or harder to distribute a film these days? LK: I think it’s much harder, possibly harder than ever due to the media conglomerates. Now, it’s much easier and cheaper to make a movie in the digital age. So you can be a teacher or do something worthwhile in your life and still also be a film-maker and hit convention circuits to get your film seen. OTH: A lot of people have noticed that you’ve been playing within the system now by letting your films get remade, like The Toxic Avenger; some fans will say you’ve sold out, so how do you react to that? LK: Yeah, we’ve sold out, but we have to do it to keep making movies; we’ve got to make money to do that. Besides, the original Toxie will always be there for people to watch, and who knows, maybe the remake will be good. You’ve got David C. Mitchell writing it and Steve Pink directing. He did Hot Tub Time Machine and High Fidelity, so it’s in good hands. OTH: And it’s not like you didn’t hold on to the rights to Toxie V, so essentially we could be getting two new Toxie movies from this. LK: Yes, I think so. OTH: Speaking of sequels, has it ever crossed your mind to try a Poultrygeist 2? LK: No, because everyone in the first Poultrygeist all died; we killed everybody in the movie just so there would be no sequel. OTH: I was hoping maybe they’d survive the Kabukiman crash and they’d be sent to the hospital and you could kind of satirize healthcare. LK: Yeah, I don’t have any interest in a sequel, but we actually a big time agent call us because he had a client that wants to remake Poultrygeist already. He said he wants to remake it the right way or something so that’s going to be interesting. But so far we haven’t received any offer. Mother’s Day has been remade. OTH: Right, and I’m assuming you probably can’t tell us when it’s coming out either because I read where (director) Darren Lynn Bousman doesn’t even know. LK: Yeah, I saw that; I haven’t even seen Mother’s Day. They never showed it to me, but I hear it’s really good. But yeah, I read that from Bousman, and I thought that was very strange. I don’t know what the deal is there. But yeah, someone wants to remake Poultrygeist! We also have a couple of producers that want to remake Class of Nuke ‘Em High. OTH: Do you think you’ll sell the rights to that one? LK: Yeah, if we make money; the only way to keep making movies is to make money, so if it’s a good deal, why not? OTH:Anything that keeps Troma in the business of making and distributing movies is a good thing. LK : Right, because even Poultrygeist sure didn’t make any money. Even though the reviews have been very good, and even though anytime it plays in a theater it does well. The problem is that economic blacklist again; movies like Cannibal: The Musical and Citizen Toxie have never been on American TV. So certainly Poultrygeist isn’t gonna get on TV. So the only way we can keep making movies is somehow get some money, so if the remakes get us some money, we can make some more movies. OTH: Before I let you go, I want to ask you what some of your favorite movies, period, are? LK: Well, I’m a big fan of Charlie Chaplin, I like John Ford, the old westerns from John Ford. And not just the westerns, I like Frankenstein by James Whale, I like all of the “great director” type movies. OTH: Yeah, I actually just saw Stagecoach a few months ago for the first time. LK: Oh, 1939, yeah. I haven’t seen that movie for a long time, but it’s a great movie, Stagecoach. I think you should get into My Darling Clementine, The Sun Shines Bright, The Grapes of Wrath, Tobacco Road. John Ford’s work gets a lot better; Stagecoach is good, but he’s a guy whose work got much bigger and better as his career progressed. OTH: Thank you for those suggestions, and thanks for your time this evening. LK: And thank you for being interested in film and being interested in us; we always appreciate that. And once again for those who are interested, the Tromadance Film Festival will be April 22nd and April 23rd in Asbury Park, New Jersey. You can go to Tromadance.com and see all of our selections, and also our panel. We’ve got the New York film commissioner…we’ve got some very interesting people on the panel who will be discussing how the distribution issues are arranging themselves today in today’s age of digital revolution and also the media conglomerates. OTH: Okay, well we’ll definitely put the word out. Thanks again for your time. LK: You too, and thank you very much!